2. Beckman Institute for Advanced Science and Technology, University of Illinois at Urbana-Champaign, Urbana, Illinois, USA, 61801. Liposomes are nanocarriers comprised of lipid bilayers encapsulating an aqueous core. The ability of liposomes to encapsulate a wide variety of diagnostic and therapeutic agents has led to significant interest in utilizing liposomes as nanocarriers for theranostic applications. In this review, we highlight recent progress in developing liposomes as nanocarriers for a) diagnostic applications to detect proteins, DNA, and small molecule targets using fluorescence, magnetic resonance, ultrasound, and nuclear imaging; b) therapeutic applications based on small molecule-based therapy, gene therapy and immunotherapy; and c) theranostic applications for simultaneous detection and treatment of heavy metal toxicity and cancers. In addition, we summarize recent studies towards understanding of interactions between liposomes and biological components. Finally, perspectives on future directions in advancing the field for clinical translations are also discussed. Keywords: liposomes, multimodal imaging, targeted therapy, theranostics, clinical translation. Diagnostic and therapeutic agents are playing key roles in early detection and treatment of diseases. Conventional methods for developing these agents often suffer from insufficient delivery of the agents to the target cells or tissues, or from toxic side effects. To overcome these limitations, much effort has been devoted in recent years towards developing effective nanocarriers to improve their delivery efficiency [1-3]. Another effective approach is to incorporate both diagnostic and therapeutic agents into a single system for simultaneous detection and therapy. To achieve these goals, effective theranostic systems need to be developed with high stability and targeting ability, and without interference between different diagnostic and therapeutic agents in the system. Among the types of nanocarriers investigated to date, liposomes remain one of the most promising systems for clinical applications . Liposomes are spherical vesicles formed from lipid bilayers. Because of their unique structure, liposomes can entrap hydrophobic agents within the lipid bilayers and encapsulate hydrophilic agents inside the center aqueous compartment, which protects the agents from degradation. The inherent advantages of liposomes, such as high agent-loading efficiency, high stability in biological environments, controllable release kinetics, and biocompatibility, provide liposomes with better pharmacokinetics and biodistribution of theranostic agents than many other carriers in clinical studies . As a result, liposomes have become one of the most successful delivery systems for detection and treatment of a variety of diseases [6, 7]. The earliest liposomes, first described in 1965, contain no surface modifications , but can be customized to have varied sizes, rigidities and biological properties by altering the lipid compositions [9-11]. These conventional liposomes, when loaded with drug molecules such as amphotericin B, have been approved and commercialized (e.g., as Ambisome, Amphotec, and Abelcet) for the treatment of fungal infections [12, 13]. Despite this success, the performance of these conventional liposomes is limited by their unprotected lipid surface. These liposomes tend to fuse with each other to reduce their surface tension, resulting in gradual payload release over time [14, 15]. In addition, serum proteins can bind to the unmodified surface, causing uptake by phagocytes, which decreases the successful delivery of these liposomes to other cellular targets and reduces their blood circulation time [16, 17]. To overcome these limitations, surface modification strategies were developed in the late 1980s and early 1990s by coating the surface of the conventional liposomes with a wide range of inert polymeric molecules to stabilize the liposomes and to provide steric hindrance for serum binding [18-20]. Among them, polyethylene glycol (PEG) is the most widely used polymer for liposome stabilization [21, 22]. Functionalization of the liposome surface with PEG can slow the liposome fusion rate and inhibit protein absorption, resulting in increased liposome stability and enhanced in vivo circulation time [23-25]. As a result, PEGylated liposomes have advanced drug delivery applications and have led to several clinically approved therapeutic drug formulations, including Caelyx, Myocet, and Doxil for the treatment of cancers [26, 27]. Table 1 summarizes some liposome products that have been approved for clinical applications [6, 28]. Despite their improved stability and enhanced circulation time, these polymer-stabilized liposomes still lack selectivity for disease targets and control of delivery timing or dosage. To overcome these limitations, several engineering strategies that modify various components of the liposomes have been incorporated to further improve their performance (Figure 1) [29, 30]. For example, the surfaces of liposomes have been functionalized with receptors for disease biomarkers and associated ligands in order to allow targeted delivery . Phospholipid bilayer formulations have been extended with a variety of synthetic phospholipids with functional groups allowing for stimuli-response properties in sensing applications. These formulations have allowed for the incorporation of new imaging agents, such as Gd3+, 64Cu and 18F, for magnetic resonance imaging (MRI) and nuclear imaging [32-34]. 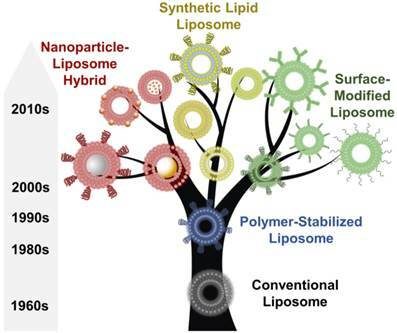 More recently, the use of synthetic inorganic or polymer nanoparticles to stabilize or support liposomes has emerged as a promising strategy to create hybrid liposomal carriers [35-38]. To date, hundreds of imaging agents and drugs, including fluorophores, nanoparticles, chelating agents, peptides, and proteins, as well as anticancer and antimicrobial agents, vaccines and oligonucleotides, , have been incorporated into liposomes for a broad range of theranostic applications . An overview of the discovery, development, and evolution of liposomes since their first report in 1965. Approved liposome products on the market and associated indications. Several recent reviews have discussed other specific aspects of liposomes, including current clinical progress of liposomes, novel structural formulations, and new applications in drug delivery. In this review, we highlight recent advances in theranostic applications of liposomes, particularly focusing on those studies that have demonstrated in vivo imaging or efficacy. We also place special focus on mechanistic investigations of the interface between liposomes and biological components, and provide our perspectives on the potential strategies for the future development of optimized liposome formulations for clinical applications. Early detection of diseases such as cancer is a major determinant of clinical outcome. As a result, the development of new diagnostic agents or analytical assays for detection of diseases has been a subject of significant interest. Control over the composition of liposomes and on the surface functionalization of many types of recognition agents has allowed a great deal of progress towards the detection of biomarkers and diseases in vivo. In this section, we summarize recent progress towards the use of liposomes as a diagnostic tool, highlighting the use of different imaging modalities as well as the detection of various types of molecular targets. Liposomes have been used as nanocarriers for many existing and widely used medical imaging techniques, including fluorescence, magnetic resonance, ultrasound and nuclear imaging applications. For all of these techniques, liposomes have been developed to increase the bioavailability, stability, and performance of existing contrast agents. We review here recent work using liposomes in this manner to enhance the existing capabilities of these medical imaging modalities. 2.1.1 Fluorescence Imaging. Fluorescence imaging is the most widely used diagnostic technique. It allows for visualization of biomolecule location, gene expression, and enzyme activity in living cells or tissues to study their biological functions . Liposomes with improved pharmacokinetic properties can help deliver fluorescence imaging agents to the target area. Kostarelos and coworkers developed functionalized-quantum dot-liposome (f-QD-L) hybrid nanoparticles by encapsulating PEG-coated quantum dots (QDs) inside the aqueous phase of DOPC-supported liposomes for cancer imaging . These hybrid nanoparticles maintained the fluorescence properties of the unmodified QDs and showed significant improvements in cellular targeting. Further tumor model experiments demonstrated that the f-QD-L particles lead to significantly higher fluorescent staining of tumor cells compared to the QDs alone after intratumor injection. They also demonstrated that the cell uptake and tumor penetration ability of the f-QD-L particles can be controlled by tuning the surface charge of liposomes to an overall cationic or zwitterionic charge using different lipid mixtures. The hybrid nanoparticles exhibited enhanced tumor penetration and retention properties in both tumor spheroids and subcutaneous solid tumors. The hybrid formulation is compatible with various types of water-soluble QDs without further modification. Near-infrared (NIR) fluorescence imaging has attracted significant attention due to the low absorption and scattering of photons within the near-infrared region by living tissue . The deeper penetration of NIR fluorescence imaging compared to visible wavelengths allows for the possibility of deeper-tissue imaging in vivo, as well as the possibility of long-term imaging without off-target effects of excitation . One potential candidate material that has been investigated for use in NIR fluorescence are rare-earth-doped nanoparticles [43, 44]. Soga and coworkers reported a liposome-nanoparticle hybrid containing Er3+-doped Y2O3 (Y2O3:Er3+) nanoparticles, which provide strong NIR fluorescence at 1550 nm under 980 nm excitation . These positively charged Y2O3:Er3+ nanoparticles were successfully encapsulated inside negatively-charged, DPPG-supported liposomes with various surface modifications. The successful NIR fluorescence imaging of several organs in mice after intravenous introduction of these liposomal Y2O3:Er3+ formulations, indicates the potential of these hybrid particles as NIR imaging agents (Figure 2a). 2.1.2 Magnetic Resonance Imaging (MRI). Non-invasive in vivo imaging enables real-time monitoring of the dynamics of medical treatments, as well as of the therapeutic response of the patient. MRI is a widely used non-invasive medical imaging technique which uses radio frequency pulses to detect the nuclear spins of water hydrogen atoms, enabling non-invasive whole-body imaging of structure and physiological processes . A key factor in improving the functional range of MRI has been the use of paramagnetic contrast agents to probe particular structures or to report on local environmental changes . As is the case with fluorophores, liposomes are able to load a wide variety of MRI contrast agents, allowing effective delivery and controlled release of these probes for enhanced imaging [48, 49]. Recently, Li and coworkers reported the development of a thermosensitive liposome formed by a mixture of 1,2-dipalmitoyl-sn-glycero-3-phosphatidylcholine (DPPC), 1-myristoyl-2-stearoyl-sn-glycero-3-phosphocholine (MSPC), and 1,2-Distearoyl-sn-glycero-3-phosphoethanolamine (DSPE)-PEG and loaded with the MRI contrast agent Gd-DTPA as well as doxorubicin (DOX) . The simultaneous delivery of both Gd-DTPA and DOX allows drug release to be simultaneously carried out and monitored, with triggerable release in the environment of a tumor by localized heating. They studied the DOX antitumor response in the EMT-6 tumor model using this thermosensitive liposomal formulation. The temperature-dependent release profile was observed to be highly correlated with the change of T1 relaxation time, and by analyzing this change in T1 relaxation time, the authors successfully used a standard pharmacological response model to predict antitumor efficacy in the EMT-6 tumor model. Ferrimagnetic iron oxide (FMIO) nanoparticles are another paramagnetic MRI contrast agent that have been utilized in the preparation of liposomal MRI probes . The liposomal FMIO nanoparticle cluster (Ferri-liposome) is able to target both tumors and the tumor microenvironment through the application of an external magnetic field. Ferri-liposomes successfully delivered a cathepsin protease inhibitor to a mammary tumor in mouse, reducing the size of the tumor. T2-weighted MR images were thus able to be used to monitor the targeting and release of ferri-liposomes in vivo (Figure 2b). (a) Left: Schematic of a PEGylated liposome with NIR-fluorescent Y2O3:Er3+ nanoparticles encapsulated. Right: NIR fluorescence microscopic images of histological sections of various organs of a mouse injected with different liposomal Y2O3:Er3+ nanoparticles. Figures adapted with permission from Ref. . (b) Left: Schematic of a Ferri-liposome. Right: T2-weighted MR images of a transgenic mouse before and 1 h and 48 h after intraperitoneal injection of Ferri-liposomes followed by 1 h of magnetic field application to the lower right tumor (white arrow). Reprinted by permission from Macmillan Publishers Ltd: Nature Nanotechnology , copyright 2011. 2.1.3 Ultrasound Imaging. Another widely used non-invasive diagnostic imaging technique is medical ultrasound, which is classified as sound waves with frequencies higher than >20,000 Hz. Ultrasound imaging is conducted by directing ultrasound pulses into tissue and measuring the echoes caused by the tissue at different reflection angles . As with MRI, contrast agents for ultrasound imaging offer the potential to specifically label particular tissue types or tumors. Liposomes containing perfluoropropane gas, named acoustic liposomes (ALs), can serve as ultrasound imaging probes . Acoustic liposomes with a diameter of 100-200 nm can also be used as a drug delivery system with passive localization to tumor tissue through the enhanced permeability and retention effect (EPR effect). When coupled with high-frequency ultrasound (HF-US), acoustic liposomes can be used to evaluate both drug delivery efficiency and antitumor efficacy . Recently, a cisplatin-loaded, DSPC-supported AL was reported to evaluate the antitumor effects on angiogenesis using HF-US imaging by Kodama and coworkers . With this method, they were able to track the flow of ALs in blood vessels and map the microvessel structures. They showed that the anti-tumor and anti-angiogenic effects of cisplatin can be noninvasively evaluated by the combination of ALs and HF-US imaging in various mouse cancer models. They further found that cisplatin decreased overall intratumoral vessel volume but not the percentage of vessel volume within the tumor. The antitumor effects of cisplatin were further confirmed by bioluminescence imaging and immunohistochemical analysis. The authors report that the use of ALs with HF-US imaging can thus be used as a new method to assess the antitumor effects of a variety of therapeutic agents. 2.1.4 Nuclear Imaging. Nuclear imaging is another non-invasive imaging technique that uses small molecule radioactive tracers . Two major nuclear imaging methods used for disease diagnosis are positron emission tomography (PET), which detects gamma rays emitted from annihilation of positrons emitted from radioactive isotopes such as 64Cu, and single photon emission computed tomography (SPECT), which detects gamma rays directly emitted from isotopes such as 99mTc . A number of liposomes have been reported which can encapsulate radionuclide tracers inside its aqueous compartment or within a chemically engineered lipid bilayer [34, 58-61]. Ferrara and coworkers reported the use of a combination of PET and fluorescence imaging to investigate the design of stable temperature-sensitive liposomes . The liposome formulations they used feature 18F- or 64Cu-labeled lipids and encapsulate the fluorophore Alexa Fluor 750 as a hydrophilic model drug. FVB mice with bilateral Met-1 tumors were used as a model organism and were imaged in vivo with microPET and optical imaging techniques after liposome treatment. They tested nine different formulations of liposomes containing Alexa Fluor 750 and functionalized with radioisotopes, and found that formulations with high cholesterol within the lipid bilayer and low osmolarity inside the aqueous compartment result in much higher tumor accumulation when compared with free drug. The tumor fluorescence images also have high correlation with PET images and ex vivo fluorescence images using a stable liposome formulation. The authors concluded that the combination of PET and optical imaging techniques will be useful in screening liposomal vehicles using live animal models. Similarly, the SPECT imaging technique can also be used to investigate therapeutic efficacy in vivo. Ting and coworkers used 188Re-labeled DSPC-based liposomal doxorubicin to evaluate the delivery efficiency and antitumor effects in a C26 murine tumor model . Tumor targeting of the liposomes was assessed by measuring their biodistribution and pharmacokinetics through in vivo microSPECT/CT imaging. The 188Re-liposome-DOX as a bimodal radiochemotherapeutic showed greater tumor inhibition and longer median survival time than either singly-functionalized 188Re-liposomes or liposome-DOX, demonstrating a synergistic effect of the combination therapy. Liposome vehicles have proven to be effective nanocarriers, able to encapsulate and protect a variety of payloads for various applications. Meanwhile, the lipid formulations of liposomes have also been engineered with specific ligands to recognize chemical and biological targets with high specificity [64, 65]. Based on designed signal transduction processes, binding of the target molecule can trigger rupture of the lipid bilayer comprising the liposome, releasing the encapsulated signal reporting agents, and thus allowing for sensitive detection of the target . We review here recent work using liposomes as the diagnostic platform for various biomolecular targets, including proteins, DNA and small organic molecules. 2.2.1 Proteins as Targets. Liposomes with lipid bilayer structure are mostly known to be responsive to enzymes which can catalyze the hydrolysis reaction of phospholipids, resulting in the rupture of the liposome. Therefore, the existence and activity of the enzyme could be quantitatively detected by using the corresponding liposomal formulation loaded with signaling agents. The detection of phospholipase C (PLC) activity was demonstrated by Chang and coworkers using fluorescent gold nanodot (AuND)-loaded liposomes . The fluorescent AuND-liposome hybrids are synthesized by incorporation of ~3 nm fluorescent AuNDs with 11-mercaptoundecanoic acid (11-MUA) and hydrophobic phospholipid membranes to form liposome-AuND conjugates. The fluorescence of the 11-MUA-capped AuNDs inside the liposome is quenched by oxygen molecules in solution. In the presence of the target PLC, enzymatic activity of PLC catalyzes the hydrolysis of phosphatidylcholine in the lipid bilayer to yield diacylglycerol (DAG) and phosphocholine (PC) products, resulting in the rupture of liposomes and subsequent release of the encapsulated 11-MUA-capped AuNDs. The released DAG molecules further interact with the 11-MUA layers on the AuND surface via hydrophobic interactions, inhibiting O2 quenching and resulting in increase of the fluorescence signal. They demonstrated the sensitive and selective detection of PLC over other proteins with a 0.21 nM limit of detection. They further used the AuND-liposome hybrid probes to determine the PLC concentrations in cell extracts, finding that PLC concentration in breast cancer cells is ~1.5-fold higher than in normal cells. In addition to liposomal colloids, approaches have been developed to assemble liposomes into micro- and nano-arrays, as well as into liposomal networks, to screen and detect membrane proteins [64, 68]. The lipid bilayer of a liposome provides a natural environment to incorporate membrane proteins, which affords them protection from denaturation and preservation of their functions. Recently, a novel method called liposome display was reported for the in vitro selection and directed evolution of membrane proteins, by displaying membrane proteins of interest on liposome membranes composed of 1:1 1-palmitoyl-2-oleoyl-sn-glycero-3-phosphocholine (POPC)/cholesterol through translation of a single DNA molecule by a cell-free translation system [69, 70]. The library of liposomes generated from this approach enabled rapid screening for membrane protein activity through fluorescence-activated cell sorting (FACS) in order to obtain a protein with desired functions. 2.2.2 DNA Molecules as Targets. In addition to phospholipase enzymes, many other molecules have been applied towards the design of stimuli-responsive liposomes to affect cargo release via physicochemical responses to external stimuli. Herrmann and coworkers designed a new approach which allows for cargo release from liposomes using specific oligonucleotides with photosensitizer modifications . Amphiphilic DNA block copolymers, DNA-b-polypropylene oxide (DNA-b-PPO), were incorporated onto the liposome surface by insertion of the hydrophobic polymer segments into the lipid bilayer through hydrophobic-hydrophobic interactions. Complimentary oligonucleotides featuring a BODIPY monoiodine modification can specifically hybridize to the surface-displayed DNA and then generate singlet oxygen on the liposome surface under light irradiation. Oxidation of the unsaturated phospholipids and polypropylene oxide comprising the liposomes resulted in liposome rupture and release of the payload. Other technologies and liposome formulations have also been explored to increase the sensitivity of DNA detection. Höök, Sjövall, and coworkers reported a method to use liposomes as chemical barcodes to detect target DNA sequences using time-of-flight secondary ion mass spectrometry (TOF-SIMS) . In their method, each liposome is encoded with a unique sequence for a particular target DNA. In the presence of the target DNA, a mixture of DNA-modified liposomes consisting of POPC or DPPC lipids are bound to a silica surface functionalized with capture DNA in sandwich-assay fashion. By using TOF-SIMS to determine the chemical fingerprint of the bound liposomes, target DNA sequences could be detected down to the single molecule level, with the potential for multiplexed DNA detection. Similarly, Zhang and coworkers reported the use of liposome-quantum dot (L/QD) complexes with a single-molecule detection method to achieve high sensitivity single-stranded DNA detection . DNA-modified L/QD complexes were enriched and purified by forming a sandwich assay through magnet separation in the presence of the target DNA. The QDs were released from enriched liposomes and measured subsequently by the single-particle detection method, which attained an attomolar detection limit. 2.2.3 Small Molecules as Targets. Liposomes responsive to various biochemical stimuli, such as pH, enzymes, and oligonucleotides have been widely reported [74-76]. However, liposomes responsive to small molecule metabolites are relatively under-explored because of the difficulty in designing a signal transduction process which couples small molecule target recognition with liposome disruption, allowing for release of the encapsulated reporter molecules. Lu and coworkers recently developed a stimuli-responsive liposome platform based on DPPC/1,2-Dipalmitoyl-sn-glycero-3-phosphoethanolamine(DPPE)-PEG liposomes, which are made responsive to small molecule metabolite stimuli with the use of aptamers and 2-acetylhydrolase (PLA2) . The conjugation of aptamer and PLA2 provides a link between target recognition (by the aptamer) and subsequent rupture of the liposome by PLA2 activity (Figure 3a). 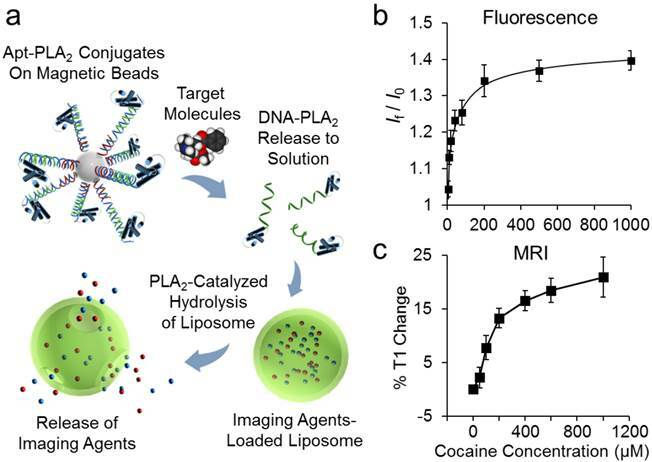 The authors demonstrated multimodal fluorescence and MRI detection of cocaine using liposomes loaded with uranin as the fluorescent dye and gadopentetic acid as the MRI contrast agent . The target, cocaine, triggered the release of DNA-enzyme conjugates, allowing PLA2 to induce rupture of the liposome, and thus resulting in release of the reporter agents. Using this method, cocaine could be detected at low micromolar sensitivity with fluorescence detection (Figure 3b) and with ∼50 μM limit of detection for MRI detection (Figure 3c). The broad scope of this strategy would allow the use of different imaging modalities to detect various small molecule targets by using different functional DNAs for potential diagnostic applications. (a) Scheme of stimuli-responsive liposomes responsive to small molecule targets, incorporating multimodal detection. Calibration curve for detection of cocaine via (b) fluorescence detection and (c) MRI detection using stimuli-responsive liposomes. Reprinted with permission from Ref. . Copyright 2016 American Chemical Society. In addition to their use in screening membrane proteins, liposome arrays have also been used for the detection of biologically important small molecules. Ahn and coworkers developed a microarray-chip assay using zinc(II)-dipicolylamine (Zn-DPA)-modified polymerized poly(diacetylene)-liposomes to detect pyrophosphate (P2O74-) ions . The Zn(DPA) modification on the liposome surface enables a red fluorescence turn-on response in the presence of pyrophosphate. By using this liposome microarray-chip assay, the authors observed the selective detection of pyrophosphate ions over many other closely-related phosphate-containing analytes, such as HPO42- and adenosine triphosphate, with a limit of detection around 100 pM. The use of a liposome microarray for the detection of K+ and Hg2+ has also been reported [79, 80]. Liposomes have demonstrated a wide range of usage in clinical use as a drug platform. To date, there have been several liposome products approved for the treatment of a variety of diseases, including fungal infections, pain management, hepatitis A, influenza, and various types of cancers [13, 81]. Many other liposomal drugs are undergoing clinical trials [6, 20, 82]. Some of these new formulations have improved targeting functions such as immunoliposomes, which are liposomal doxorubicin functionalized with antibodies targeting the epithelial growth factor receptor (EGFR) . Others liposome formulations are loaded with different types of therapeutic agents, including L-BLP25 peptide (Stimuvax) , irinotecan (MM-398) , and cisplatin (Lipoplatin) , or can target broader indications than existing formulations . To further advance the use of liposomes as a drug platform, researchers have been focusing on improvements in drug loading ratio and delivery efficiency, as well as improved treatment of a broader range of diseases. In this section, we review recent progress in the use of liposome nanocarriers for applications in small molecule therapy, gene therapy, and immune therapy, as well as for combined theranostic applications. Delivery of small molecule drugs is one of the first clinical applications demonstrated by conventional liposomes . Liposomal small molecule drugs showed improve pharmacokinetics and efficacy compared to free drugs. Conventional liposomes or PEGylated liposomes use a passive targeting strategy mediated by the enhanced permeability and retention (EPR) effect to selectively accumulate chemotherapeutics at the tumor site [89, 90]. To improve this passive targeting effect, one research focus is on the incorporation of active targeting agents on the liposome surface. Folic acid, peptides, antibodies, and aptamers have been studied in conjunction with liposomes for enhanced cancer therapy [91-94]. Lu and coworkers previously demonstrated a PEGylated liposome system functionalized with a DNA aptamer called AS1411, a 26-mer G-quadruplex deoxyribonucleotide, which can selectively bind nucleolin (NCL), an mRNA-stabilizing protein overexpressed on the plasma membrane of many types of cancer cells. Cellular studies demonstrated that the AS1411-functionalized liposomes were able to target MCF-7 cancer cells specifically versus non-cancer LNCaP cells . Animal studies confirmed that aptamer-functionalized liposomal doxorubicin allowed for enhanced tumor penetration and inhibition of MCF-7 tumor growth in mice (Figure 4a) . Lu and coworkers further investigated the interactions between PEG backfilling and DNA aptamers on the surface of liposomes and revealed that a spacer of appropriate length is important for the targeting aptamer sequence to stand out from surrounding PEG molecules to achieve an optimized targeting effect . (a) Left: Schematic of AS1411 aptamer-modified liposomal DOX. Right: Confocal fluorescence images of MCF-7 cells in tumor sections showing in vivo tumor penetration ability of aptamer-liposomes. Reproduced from Ref. with permission from the Royal Society of Chemistry. (b) Left: Schematic of a nanochain structure consists of one liposome and three iron oxide nanoparticles. Right: Fluorescence images of a histological section of mouse 4T1 tumor 48 h after intravenous injection of liposomal DOX, with and without RF treatment. Reprinted with permission from Ref. . Copyright 2012 American Chemical Society. (c) Left: Schematic of a multifunctional liposome with c(RGDyK) modification on surface and paclitaxel encapsulated. Right: T1-weighted MR images of a mouse before and after treatment with the multifunctional liposome. Reproduced from Ref. with permission from the Royal Society of Chemistry. Enhanced tumor targeting can also be achieved by targeting features of the tumor microenvironment, such as the elevated presence of protease enzyme activity. For example, anti-nucleosome monoclonal antibody (mAb) 2C5 was conjugated to PEGylated liposomes to target matrix metalloprotease 2, which is upregulated in the tumor microenvironment, improving cancer-cell specific delivery . Another strategy is to use remote physical stimuli to facilitate delivery of small molecule therapeutics to tumors. 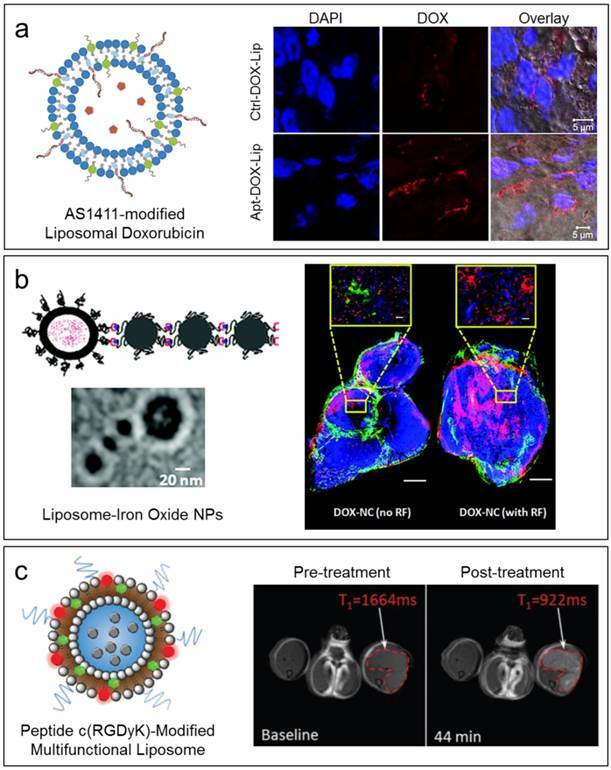 Karathanasis and coworkers developed a multicomponent nanostructure assembled by three magnetic nanoparticles and one doxorubicin-loaded DPPC-based liposome . The liposomes in the multicomponent nanostructures can be triggered to release their loaded drugs under radio frequency, resulting in deep penetration and widespread cytotoxicity throughout the entire tumor (Figure 4b). In addition to cancer chemotherapy, liposomal small molecule drugs have also been used for the treatment of other diseases. For example, linolenic acids have been successfully loaded into liposomes through mixing with standard lipids phosphatidylcholine and cholesterol, and the resulting liposomal formulations have demonstrated potent antibacterial activities against antibiotic-resistant Helicobacter pylori (H. pylori) infection . Szebeni et al. studied the effects of surface modifications and internal content of liposomes on cardiovascular diseases with various phospholipid compositions including HSPC, HSPG, EPC, and DSPE . They tested a porcine model of complement activation-related pseudoallergy (CARPA) and found that high negative surface charge and the presence of a shape-modifying drug are major contributors to CARPA progression. This study provided deep insights into the optimization of liposome parameters that aimed to reduce the risk of infusion reactions to liposomal drugs. Liposomes have also been engineered to improve peritoneal dialysis for detoxification of endogenous metabolites . Liposomes supported by DPPC with a transmembrane pH gradient were used to trap exogenous compounds in the rat peritoneal cavity, increasing the clearance efficiency of several drugs and showing a 20-fold higher uptake capacity compared to those of intravenous lipid emulsions. In addition to small molecules, macromolecules such as oligonucleotides can also be delivered into cells to treat disease . Several liposomal formulations for therapeutic delivery of gene-based medicines are currently in clinical trials [104-106]. We highlight here some recent liposomal formulations that have been developed for enhanced gene delivery. The first example is the use of liposome-polyethylenimine (PEI) complexes (lipopolyplexes) for the delivery of DNA and siRNAs . The formulation was prepared by addition of liposomes to pre-formed polyplexes based on low molecular weight PEI F25-LMW, which resulted in an observed reduction in zeta-potentials and the absence of aggregation after functionalization. Both DNA transfection and siRNA-mediated knockdown were achieved. The lipopolyplexes demonstrate enhanced biological activity and decreased toxicity as compared to PEI complexes. Another liposomal formulation for siRNA delivery was synthesized by mixing liposomes and a targeting peptide with siRNA at an optimized ratio . The liposome complex containing siRNA against endogenous luciferase and GAPDH successfully silenced the corresponding genes in 3 cell lines (1HAEo, B104, Neuro2A-Luc) in vitro with 80% efficiency. The delivered siRNAs were further demonstrated to be located in the perinuclear region of the cytoplasm. Gene therapy can also be combined with small molecule therapy to achieve enhanced efficacy. Wang et al. reported a cationic PLGA/folate-coated PEGylated polymeric liposome for targeted co-delivery of drug and gene . They demonstrated that doxorubicin and plasmid DNA can be delivered into MDA-MB-231 tumor cells with high gene transfection and drug delivery efficiency. To further realize the potential of liposome-based systems for gene therapy, mechanistic studies have also been applied to fully understand the delivery process. 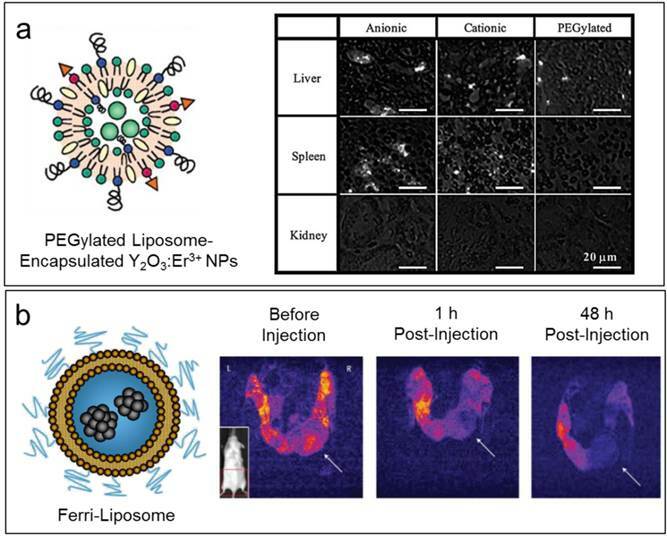 Anderson and coworkers studied the mechanism of lipid nanoparticle (LNP)-mediated siRNA delivery using cellular trafficking probes. They observed that cationic LNPs required Cdc42-dependent macropinocytosis to enter cells and NPC1-deficient cells showed enhanced cellular retention of LNPs inside late endosomes and lysosomes with increased silencing of the target gene, indicating that siRNA delivery efficiency might be improved by using delivery vehicles that can escape the recycling pathways . Liposomes have also been investigated in conjunction with adjuvants for immunotherapy, which is the treatment of disease by means of modulating the normal immune response [111, 112]. The immune system consists of two components, innate and adaptive immunity [113, 114]. Innate immunity is highly conserved and includes elements of the immune system that provide immediate host defense. This can include cells (neutrophils, monocytes, macrophages), pathways (complement, cytokines), and is sometimes considered to include other physical, chemical, and microbiological barriers towards microbial infection. The adaptive immune response is carried out by B and T lymphocytes, and is found in higher animals. Compared to innate immunity, adaptive immunity is much slower to develop but retains memory for specific antigens. Both innate and adaptive immunity have been investigated for immunomodulatory interventions, probing stimulation and inhibition of processes such as T cell activation or signaling pathways such as Toll. As well-tolerated vehicles that can be easily functionalized to display other moieties on their surface, liposomes have been investigated as potential elements of immunomodulatory therapies for many years, including marketed vaccines for influenza (Inflexal®), Hepatitis A (Epaxal®), and recently malaria (Mosquirix) . The design considerations for liposomal vaccines have been reviewed recently . Researchers are developing new liposomal formulations for different immunotherapeutic purposes. For example, Cai and coworkers investigated encapsulation of antigens by cationic liposomes and investigated dendritic cell activation using these complexes . By altering the overall charge of the liposome surface by changing the ratio of neutral DOPC to cationic DOTAP, the strength of the resulting response towards the prototype antigen ovalbumin was controlled. Investigation of the mechanisms involved suggested a role of ROS signaling in the pathway of liposome-induced activation. Another example is to use encapsulated cyclic di-GMP (c-di-GMP) as an adjuvant which, in combination with a fusogenic liposome formulation based on a synthetic pH sensitive lipid, YSK05, allowed for significant cytosolic delivery of c-di-GMP and enhancement of antigenic response . This is notable due to the cell impermeability of the c-di-GMP molecule based on its highly charged phosphate groups, which otherwise would prevent its use as an adjuvant. In addition to encapsulation, direct surface modification of a liposome with antigens can also lead to novel immunotherapies. Mirkin and coworkers utilized oligonucleotide-based agonists or antagonists of Toll-like receptor 9 (TLR9), an endosomal protein involved in activating the innate immunity pathway . When assembled on the surface of a liposome formed by the unsaturated lipid DOPC, the dense spherical nucleic acid (SNA) construct was taken up efficiently by cells and could increase or decrease the immune response accordingly. A major subject of recent interest has been the development of theranostic, which either combines multiple imaging modalities or imaging and therapeutic functions in one complex . Due to the flexible encapsulation capabilities of liposomes, they can be further engineered to be able to co-deliver different imaging agents and therapeutic drugs, allowing multimodal imaging as well as evaluation of the effects of therapy. Lu and coworkers previously developed a liposome formulation containing phosphatidylethanolamine (PE) lipids, which can bind to Hg2+ ions tightly and becomes reoriented in the process . By encapsulating a Hg2+ chelator meso-2,3-dimercaptosuccinic acid (meso-DMSA) as well as a fluorescent dye reporter, a theranostic construct was produced. In response to Hg2+ ions, a fluorescent response was produced proportional to the Hg2+ concentration, and a proportional amount of meso-DMSA would be released. In this way, the liposome complex serves as a “smart” theranostics system, which could autonomously adjust dosage in response to the metal ion stimulus. Ostrowski and coworkers designed a PC-based liposome containing a photochemical nitric oxide (NO) donor, mac-CrONO . Interestingly, encapsulation of the NO precursor both increased the quantum yield of NO formation and altered the rate of NO release. The encapsulated mac-CrONO produced a steady controlled production of NO, as opposed to a single bolus release observed with unencapsulated mac-CrONO. Furthermore, as the mac-CrONO complex is fluorescent, simultaneous imaging of the liposome may be possible, enabling theranostic function. By incorporating both drugs and imaging agents, liposomes were reported to evaluate the effects of cancer therapy. Kostarelos and coworkers co-encapsulated the dye indocyanine green (ICG) and anticancer drug doxorubicin into an HSPC-supported liposome, and functionalized this liposome with a humanized antibody targeting MUC-1 . This theranostic liposome was studied in a murine breast cancer model, and demonstrated the ability to combine tumor-specific targeted therapy with diagnosis through optoacoustic tomography. Another multifunctional liposome formulation was reported by Li et al., with multiple reporting groups functionalized on the DSPC-based liposome surface and doxorubicin encapsulated as an anticancer drug . The combination of MRI contrast agent (Gd-DOTA), near-infrared fluorescent dye (IR dye), drug (doxorubicin), and radioactive ions for SPECT (99mTc) or PET (64Cu) imaging provided a wide variety of correlative imaging comparisons. These liposomes were tested in a mouse xenograft model of head and neck cancer and demonstrated effective multimodal imaging. Zhou and coworkers designed a DSPC-supported liposome co-encapsulating a drug (paclitaxel), an MRI contrast agent (Gd-DOTA), and bearing a surface-functionalized targeting agent (cyclic RGD peptide) and fluorophore . This combination theranostic agent demonstrated MR and fluorescent imaging of tumors both in vitro and in vivo, and showed effective uptake by tumors in a mouse xenograft tumor model (Figure 4c). The rational design and engineering of liposomes for diagnostic and therapeutic applications in vivo is predicated on our ability to predict the interactions between liposomes and biomolecules or cells present in the biological milieu. In order to advance this fundamental understanding, researchers have carried out both theoretical and experimental approaches into the many types of liposome-biomolecule and liposome-cell interactions that affect the circulation, distribution, and delivery of liposomes in vivo. The first major class of interactions that is important in better understanding the fate and functionality of liposomes involves understanding the interaction of lipids with biomolecules such as proteins and nucleic acids. A great deal of research has demonstrated that liposomes functionalized with these biomolecules can have added functionality from those biomarkers used independently as recognition agents or for purposes of passivation or selective uptake. However, in contrast, fundamental understanding of lipid-biomolecule interactions on the molecular scale is not as well understood, although these molecular interactions underlie critical aspects of liposome-mediated delivery including the protein corona, cellular uptake and cargo release. Binding to serum proteins is known to affect the uptake kinetics of nanomaterials. Understanding protein-lipid interactions at the molecular level may help to define lipid formulations with rationally tuned protein-binding or uptake properties. Due to the wide variety of proteins found in serum, it is important to develop methods to rapidly assess protein-lipid interactions. Vorauer-Uhl and coworkers utilized the Bio-Layer Interferometry platform, previously developed for studying protein-protein interactions, for studying protein-liposome binding interactions . Multiple formulations of liposome were tested, and the ability of the BLI platform to determine kinetic rates and affinity constants was demonstrated. Similarly, Gavin and coworkers designed a microarray assay to investigate protein recruitment to the surface of liposomes in a quantitative and high-throughput manner (Figure 5a) . These approaches provide a way to address fundamental physical parameters that will be necessary for establishing an understanding of liposome function in biological systems. Approaches that link molecular-level design with higher-level properties of nanomaterials are also very important. Kros and coworkers investigated liposome fusion using a functional mimic of the SNARE protein complex that regulates this process in cells . The use of a minimized form of the SNARE proteins enabled the identification of specific parameters allowing extremely efficient liposome fusion. The lipid-peptide complexes could be tuned so as to allow anywhere from a single fusion event to tens of thousands of fusion rounds, which provides a link between molecular engineering of protein-lipid complexes and lipid fusion, a major design aspect of interest for delivery of therapeutics or imaging agents. Nucleic acids are another class of biomolecule utilized in a number of nanomaterial formulations. Aptamers, the nucleic acid analogue of antibodies, have been investigated as a biocompatible targeting moiety for specific cell types . Furthermore, nucleic acid-liposome complexes (lipoplexes) have been well-investigated for gene therapy applications. Improving the properties of these formulations requires improvements in our understanding of these interactions. The interaction of cationic liposomes with DNA and human plasma proteins was investigated by Laganà and coworkers . Admixtures of DC-Chol, zwitterionic lipid DOPE and DNA were found to form a multilamellar structure with DNA sequestered between lipid bilayers. Interestingly, upon interaction of these lipoplexes with human plasma, different patterns of protein binding were observed compared to unmodified cationic liposomes, with a significant increase in binding of immunoglobulins gamma proteins to lipoplexes versus cationic liposomes. This alteration in protein corona was proposed to indicate formation of clusters of multilamellar lipoplexes, and might possibly explain the observed accumulation of lipoplexes in the liver in vivo. Understanding the uptake of liposomes also relies on understanding liposome-cell interactions. Liposomes are known to undergo several pathways of cellular uptake, including membrane fusion and endocytosis, although the relative contribution of each route varies with lipid composition, liposome size, and target cell type . Detailed biophysical investigation can help elucidate factors affecting delivery efficiency and uptake mechanism, which can help in the design of more effective theranostic agents. Several fluorescence assays of liposome internalization and membrane fusion exist, which can be used to track inner and outer lipid monolayers, as well as identify intermixing of aqueous content . These techniques can be utilized to systematically investigate individual parameters. Kiwada and coworkers carried out detailed investigation of uptake of lipoplexes by epidermal cells with variations of surface charge, structure, and particle size . Lynge et al. used a polydopamine (PDA) coated thin film with zwitterionic liposomes embedded within to study the efficiency of surface-based drug delivery. The cargo delivery to myoblast cells by surface-immobilized liposomes was quantified by a fluorescence-based assay (Figure 5b) . 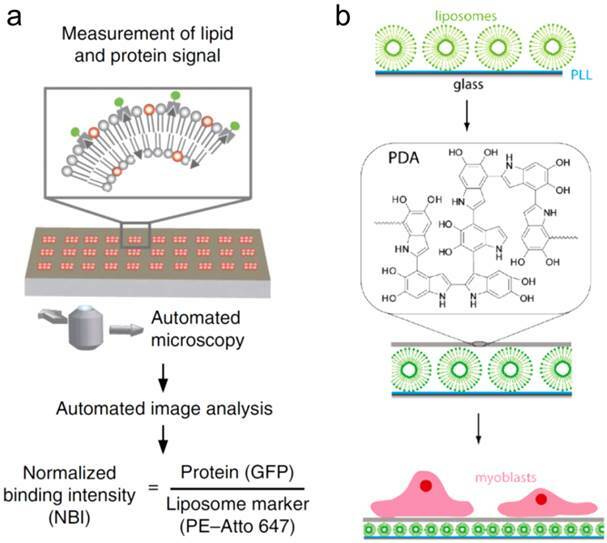 (a) A multiplexed and high-throughput protein-lipid interaction assay to measure protein recruitment to liposome membranes. Reprinted by permission from Macmillan Publishers Ltd: Nature Method , copyright 2014. (b) Scheme showing the surface based fluorescence assay to study the assembly of liposome-polydopamine coatings and the interaction with myoblast cells. Reprinted with permission from Ref. . Copyright 2011 American Chemical Society. A major concern in the in vivo delivery of any cargo is the resulting distribution within different organs. Liposomes, and in particular “stealth” liposomes (which are functionalized with passivating polymers such as PEG), have been studied as a possible approach to extend the circulation lifetime of drugs or to minimize nonspecific accumulation by organs such as the kidneys. Pumerantz et al. investigated the pharmacokinetics and biodistribution of liposomal vancomycin within a mouse model of methicillin-resistant Staphylococcus aureus infection . Both liposomal encapsulation and functionalization with PEG assisted in reducing the accumulation of vancomycin in the kidney, which may reduce the known nephrotoxic side effects of vancomycin. Another study focused on the pharmacological distribution of zoledronic acid (Zol), an inhibitor of farnesyl pyrophosphate synthase . In this work, the distribution of liposomal Zol within a mouse tumor model was investigated, and the effect of folate receptor targeting also studied. Interestingly, whereas many other liposomal drugs attenuate off-target side effects of drugs, enhanced toxicity was observed from all forms of liposomal Zol studied. Further attempts to mitigate this observed toxicity were only partially successful, but indicated the involvement of macrophage uptake in the mechanism of toxicity for the encapsulated Zol complex. Moreover, a gold nanorod (AuNR)-liposome hybrid was demonstrated for live animal imaging via optoacoustic tomography . This approach may provide new avenues for long-term tracking of liposome biodistribution, although care must be taken to ensure that functionalization with AuNRs does not affect the uptake or distribution properties. We have highlighted recent progress in developing modified liposomes for either diagnostic or therapeutic, as well as theranostic applications. Mechanistic understanding of interactions between liposomes and biomolecular or cellular components, which is critical to liposome applications, is also summarized. Many strategies have utilized liposomes as an analytical tool, for the diagnosis of diseases and the detection of analytes important for the early detection of diseases. Specific properties of liposomes that have been leveraged to enable these applications are (i) the ability of liposomes to contain both hydrophilic and hydrophobic molecules, enabling incorporation of a wide range of imaging or contrast agents; (ii) the use of functionalization strategies to attach new biomolecules to the surface of liposomes, enabling the surface display of recognition units such as peptides or DNA aptamers; and (iii) the use of lipids that can be selectively degraded by enzymes such as phospholipase C and PLA2. Further development of new types of lipids as well as new reagents to enable signal transduction processes will afford an even broader range of diagnostic applications. Furthermore, many liposome formulations have been developed to load and deliver drugs to the diseased tissue efficiently by incorporating targeting agents, and by combining multiple imaging agents and drugs together, allowing for improved theranostic use of liposomes. Towards this goal, researchers have taken advantage of the high loading capacity of liposomes for both hydrophilic and hydrophobic drugs, as well as the ability to attach targeting moieties to liposome surfaces. In addition, significant efforts have also been made to screen synthetic lipid combinations and to explore novel nanostructures, such as liposomal SNA construct, for efficient delivery of gene and immunologic therapies. In order to develop optimized liposomal formulations suitable for future clinical applications, we envision three potential strategies that will significantly improve the functionality and clinical performance of this excellent scaffold. The first strategy is to employ high-throughput screening technologies to improve liposome formulation. The second is to use native materials directly derived from patients to develop more biocompatible delivery particles as a method of “personalized medicine”. Finally, novel strategies that may accelerate the process of liposome optimization and translation from lab to clinic are needed. A promising approach towards speeding the process of liposome development is the use of high-throughput screening technologies towards formulation optimization. Combinatorial chemistry has been widely practiced in the field of small molecule therapeutics, but has begun to be applied towards lipid mixtures only recently. 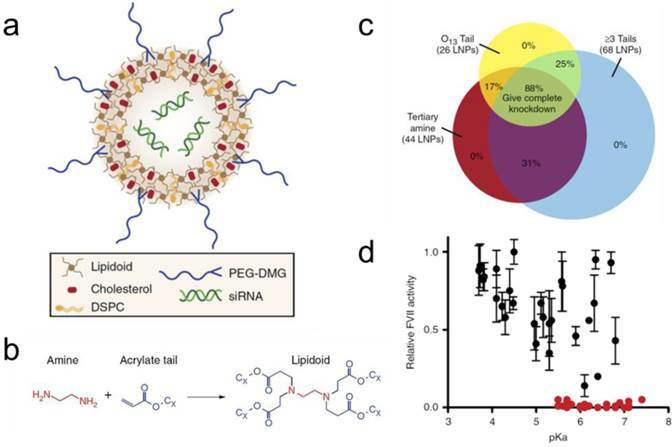 For example, the Anderson lab developed a combinatorial library of lipid-like materials, and Anderson, Langer, and coworkers utilized this technique for rapid optimization of lipid-coated RNA nanoparticles in several in vivo models . This work has been demonstrated for the delivery of siRNA, RNAi, as well as mRNA, for potential applications in gene silencing or gene therapy [137-139]. Figure 6 shows an example of the use of combinatorial chemistry to synthesize a library of 1,400 biodegradable lipidoids and the corresponding lipid nanoparticles (Figure 6a and 6b) . Further in vivo studies confirmed strong nanoparticle structure-function relationships for siRNA delivery to hepatocytes in mice. Nanoparticles with more hydrophobic chains and pKa values of 5.5 or higher possess better in vivo transfection ability (Figure 6c and 6d). The generality of the liposome scaffold and of the rapid screening ability demonstrated here can be envisioned to apply to other types of cargo, and may speed the process of theranostic development. In a parallel approach, another intriguing possibility is the use of patient-derived lipids, which may allow for personalization of liposome-based theranostics. This approach has been demonstrated in the construction of encapsulated nanoparticles within a lipid bilayer obtained from the patient's own cells . Multiple approaches have been developed for the construction of lipid-coated nanoparticles, and have been reviewed recently . One such approach may have general application towards a variety of cargoes. It has been demonstrated by multiple groups that membranes can be harvested from erythrocyte or platelet cells, and used to coat particles directly [141-143]. This process allows native lipid mixtures to be used for nanoparticle surface functionalization, which should be fully biocompatible with the patient from which the cells were derived. Thus far, most applications of this technique have utilized only solid core particles, but the methods for processing cellular membranes may be expanded towards the production of fully biocompatible liposomes with other types of cargo. (a) Scheme of the nanoparticles formulated from lipidoid, cholesterol, DSPC (phospholipid), PEG2000-DMG and siRNA; (b) Combinatorial addition chemistry of alkyl-amines to alkyl-acrylate; (c) Ninety-six nanoparticles were tested for siRNA delivery to hepatocytes in mice. Eighty-eight percent of nanoparticles fitting three structural parameters achieved nearly complete gene knockdown; (d) pKa values significantly influenced siRNA delivery efficacy of nanoparticles. Reprinted by permission from Macmillan Publishers Ltd: Nature Communications , copyright 2014. As the overall goal of research in drug delivery or theranostic vehicles is to develop clinically relevant formulations, it is important that the whole process of translation from lab to clinic is taken into consideration . A factor that may be useful in this regard is to take advantage of substances (lipids, polymers, or other compounds) that are already approved by regulatory agencies such as the Food and Drug Administration (FDA) or Emergency Medical Services Authority (EMSA). Using materials that have already undergone regulatory approval or which are generally regarded as safe allows researchers to utilize materials with established biocompatibility, which in turn should speed up the process of regulatory approval of the resulting final composite nanomaterials. A review of the regulatory and safety concerns regarding lipids used in pharmaceutical applications has been published that covers this topic in more detail . In conclusion, we foresee a bright future for the continued use and development of liposomes as vehicles for imaging agents and in drug delivery, and thus in their potential for simultaneous diagnostic and therapeutic functions. In particular, we believe that further developments in the fundamental understanding of lipid interactions, improvements in rapid formulation screening, and the use of strategies for maximizing clinical compatibility will play major roles in improving the function of liposomes in future theranostic applications. The Lu group work described in this review has been supported by a seed grant from the Beckman Institute of Science and Technology and an Interdisciplinary Innovation Initiative Program at the University of Illinois at Urbana-Champaign. The authors thank Mr. Ryan Lake from University of Illinois at Urbana-Champaign for proofreading of the manuscript. Corresponding author: yi-luedu; phone: 217-333-2619; fax: 217-244-3186.